Ultimately, what we bring to our reading is just as important as what is in any particular book. The novel can be a literary Sweden, neutral to all who care to enter it, and a mirror for the beliefs and inclinations of those who gaze within. Our agendas overwhelm those of the author, a statement that implicitly assumes that an author has an agenda. But when we read a book and find our own beliefs playing out across the canvas created by the writer, when we are so engaged that we feel a book was written just for us, then that is the time when an author's intentions are realized. When we make the story our own, the author has made his story ours. Stories set in worlds that look a bit like ours, but aren't, have a head start in this regard. With 'The Passage,' Justin Cronin brought about the end of our happy lives and showed us what came afterwards; more of the same, turned up to eleven, with, of course, a backdrop of monstrous vampires. In 'The Twelve' he sidesteps the obvious chronological follow-up and gives readers instead a look at what was happening elsewhere while the characters of 'The Passage' were dealing with their not-so-shiny new lives. It's a smart move, an engaging novel, and a testament to a form that deserved resurrection, the 1980's horror epic. 'The Twelve' begins with a clever recap of 'The Passage,' told in King James prose, as a document from a religion in the far future. It's just the first of many cut-and-paste styles that Cronin will cut and paste to keep his epic-length novel from seeming epically long. Cronin's prose is a standout in this novel, because it is all over the map, literally. Cronin includes maps as part of his story, and they help move things along, help readers get a fix on the many stories he's got rolling along and break up the pages. But you'll also find diary inserts, news stories, all sorts of variety. In the straightforward narratives that comprise the bulk of the book, Cronin steers a passage between thumping adventure and literary introspection with a deceptive ease. Like 'The Passage,' 'The Twelve' does a great job of taking pockets of the present and re-creating them in his post-apocalyptic America. We get a hero-survivalist in Denver, happy families frolicking in the field some 80 years later, and some twenty years after that, three communities; Kerrville, Texas, Freeport, Texas and the Homeland. One of these things is not like the others, but Cronin writes with the sort of neutrality that lets readers of all stripes find themselves in the heroes and the sorts of folks they might dislike in the villains. He gives us a gallery (and at the end of the book, a handy list) of great characters, some of whom we met in 'The Passage,' much later in the game, and some new characters as well. The way their paths cross and re-cross is entertainingly complex. Cronin does some very interesting things with the horror-epic-sequel form. As with 'The Passage,' Cronin is pretty light on the monsters here. They pop up now and again to shred some extras, and perhaps some characters we might have expected would make it through, but this book is not about the monsters. It's about the survivors. You get a post-apocalyptic road trip, a bit of a spy novel, and families of blood and choice making their way in a world that makes ours look pretty kind by comparison. As a reader, you get the delightful prospect of putting the story together, and of finding your own beliefs, whatever they may be, projected into the future. Cronin's facility for being all things to all readers is not to be underestimated. He makes a whole lot of fun feel like a whole lot of fun, but something richer as well, a look at humanity with the special effects of our lives stripped away. He does so with his own special effects, but as readers, we're caught up in the commotion. 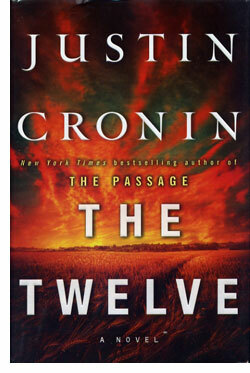 By virtue of the fact that Cronin sidesteps the usual chronological narrative conventions of the sequel, 'The Twelve,' while it is certainly best read after 'The Passage,' actually manages to sort of stand on its own and exceed the entertainment value of the first book, which is no small feat. Both books are, of course, monuments to the sort of book that we have not seen since the heyday of horror in the 1980's. They speak to the power of the form, those immersive prose mirrors that show us our hopes and our fears. The vampires in these books are afraid of mirrors. Perhaps, were one of them to read these books, they might find something truly terrifying within — us.